WASHINGTON, D.C. -- Gallup's Economic Confidence Index averaged -17 in March, essentially the same as the -16 measured in January and February. The index increased to -7 in May 2013, but then slowly declined. The average plummeted sharply to -35 in October amid the federal government shutdown, but gradually improved toward the end of 2013. 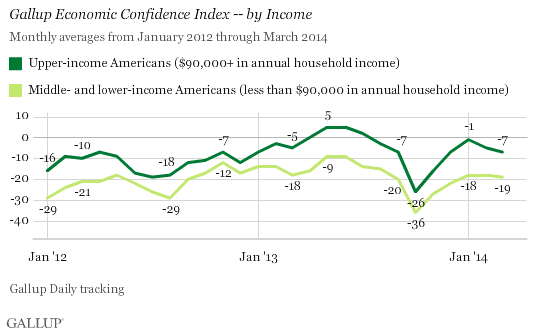 Confidence has held steady since the beginning of 2014. The March results are based on Gallup Daily tracking interviews with more than 15,000 U.S. adults. 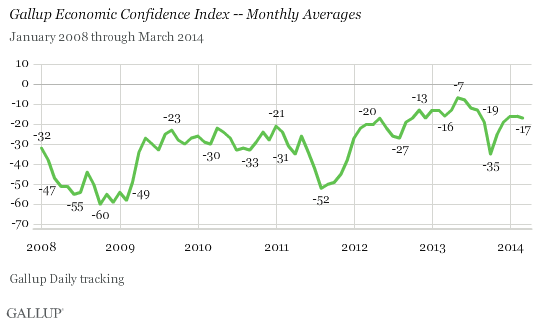 Gallup has been tracking Americans' confidence in the economy daily since 2008. In that time, the monthly index score has ranged from last May's high of -7 to a low of -60 in October 2008 during the economic recession. The Gallup Economic Confidence Index is the average of two components: Americans' views on the current economic situation and their perceptions of whether the economy is getting better or worse. The theoretical high is 100, if all Americans were to say the economy is "excellent" or "good" and that it is getting better; the theoretical low is -100, if all Americans were to say the economy is "poor" and getting worse. In March, 19% of Americans rated the economy as excellent or good, while 36% rated it as poor, for a current conditions score of -17, up slightly from last month's -18. Meanwhile, 39% of Americans said the economy is getting better, while 56% said it is getting worse, for an economic outlook score of -17, slightly more negative than the -15 found in February. Americans who make $90,000 or more in annual household income tend to have more confidence in the economy than those who make less. Upper-income Americans had an index score of -7 in March, while middle- and lower-income Americans had an index score of -19. Upper-income Americans had a positive index score in May through July of 2013, and almost crossed that threshold again at the start of 2014. However, their score has dropped each month since January, while middle- and lower-income Americans have had a lower, but steadier, score. 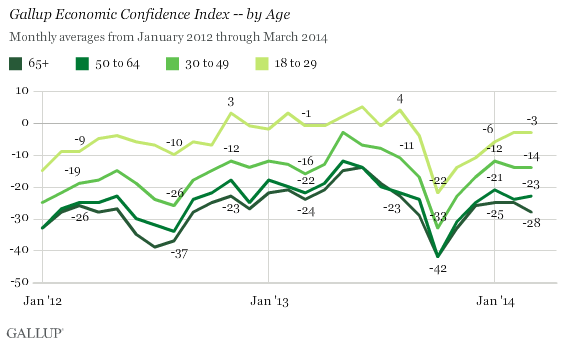 Younger Americans, those aged 18 to 29, are consistently more confident in the economy than older Americans. The index score among 18- to 29-year-olds averaged -3 in March , compared with the -14 found for Americans aged 30 to 49, -23 for 50- to 64-year-olds, and -28 for Americans 65 and older. Younger Americans are significantly more likely to be Democratic than older Americans, who are more likely to be Republican. Democrats overall have had a consistently more positive view of the economy since Barack Obama became president. These age differences reflect at least in part the powerful effect of politics on economic confidence. Americans continue to be more negative than positive about the economy, and their level of confidence has not changed much in 2014 after the post-shutdown recovery in economic confidence in November and December. Still, Americans are more confident in the economy on a relative basis than at most other times since 2008. As has been the case for the past couple of years, Americans' confidence reflects various mixed signals about the health of the overall economy. There are positive signs such as declining unemployment, growing GDP, and a recovering housing market. But some negative signs remain, such as relatively limited economic growth and an unemployment rate still higher than it was before the recession. Americans may need to see more consistently positive news before they are ready to give the economy a positive review overall. Results for this Gallup poll are based on telephone interviews conducted March 1-31, 2014, on the Gallup Daily tracking survey, with a random sample of 15,166 adults, aged 18 and older, living in all 50 U.S. states and the District of Columbia. Gallup's Economic Confidence Index held steady at -18 for the week ending March 23, with neither component of the index showing any change from the previous week. Washington, D.C., and San Jose, Calif., tie for the highest Gallup Economic Confidence Index scores in 2012-2013 among the 50 largest U.S. metropolitan areas. Jacksonville, Fla., had the lowest score.